What is the difference between an ultrasonographer and an ultrasound technician? The good news is that essentially these two career fields are the same. Most often an ultrasound tech is associated with OB/GYN practices and usually is in charge of doing ultrasounds on developing babies. Often an ultrasonographer is a generalized term that applies to the whole medical field of ultrasound technology. This means that someone could be in the military, a physical therapy center, or even work as an ultrasound technician on animals in a veterinary clinic. Currently, as it stands today, most ultrasonographers work in hospitals or in private physician’s offices and laboratories. The good news for everyone is that this industry is slated to grow by almost 20% from the year 2008 to the year 2018. (According to the Bureau of Labor Statistics). As this industry grows, a greater percentage of these professionals will work in private settings and clinics, and the number who work in hospitals will shrink relative to the rest of the opportunities. Ultrasound techs who work in private clinics or physicians offices may have duties that are related to maintaining old equipment and ordering new equipment. Those who work in hospitals may not have these same responsibilities. They may be part of a large team of people, and only one person may be assigned to duties like caring for equipment. However, in a hospital setting, they may be required to lead a large team of sonographers, and this may require doing things like scheduling or training new staff. Mentoring also plays a large role in the responsibilities of a senior technician. Regardless of whether they work in a hospital or in a clinic, sonographers are all responsible for taking sound-based images of patients. Most of these images have been ordered by a doctor. The doctor will often advise the tech about which organ they want to have an image of. In order to capture the right body part at the right angle, the sonographer will have to adjust the equipment and adjust the patient. Once they have taken the images, they must choose the best image for analysis. While this may seem simple, it can be a quite a challenge as many judgement calls need to be made to interpret which is the “best” image. This may be one of the most important parts of the ultrasonographer’s job because its critical for the doctor to make an accurate diagnosis. As far as other qualifications, these professionals gain the skills that they need to accomplish these tasks while they are in school. 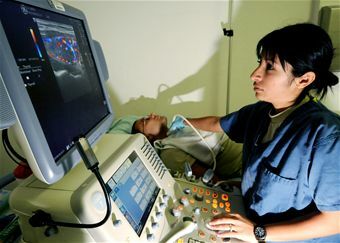 In school, they will typically complete a degree in medical diagnostic sonography. However, there are many aspects of the job that are not merely technical. These aspects include dealing with patients. Many patients may be nervous or upset about their procedures. It is part of the ultrasound tech’s job to make sure that their patients feel calm and comfortable.